Image Size: 22 X 16.5 in. 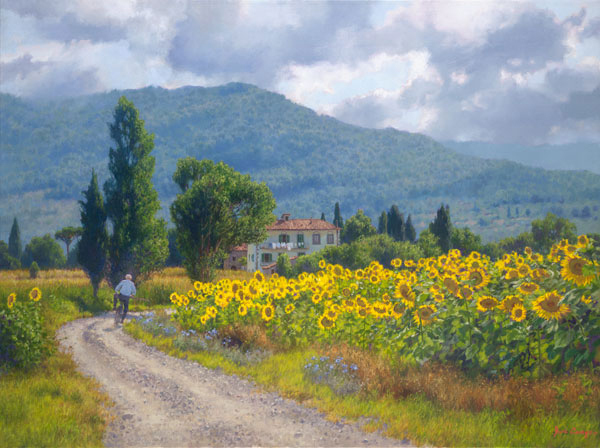 “In July and August, wonderful patches of solid gold appear and flourish across the Tuscan countryside,” says artist June Carey. “Closer inspection reveals vibrant fields of sunflowers basking in the hot sun, bowing rows of big happy faces. Even when their giant heads, heavy with mature seeds, begin to hang from the weight they still seem lighthearted. “Girasole (singular) or girasoli (plural) is Italian for sunflower. Gira means “turn”, and sole means “sun.” People think the flowers actually turn to follow the sun. I have spent time studying this and can say that once the flowers are mostly open, they seem to stay facing primarily east, in Italy, and also in California. “Finally, in My Girasoli, I achieved something I always wished for: to live in a painting! (The villa I share with my neighbors is in the background.) Each year the sunflower crop is alternated, usually with maise. I was sad to learn the field beside the house was not going to be sunflowers last year, when I was there. But, Francesco, my neighbor on the bicycle, told me that these sunflowers were newly planted just up the lane. Francesco has a huge garden down the road. He and his wife, Maria, who live in the apartment above mine, ride their bikes to and from their garden every day. Here he is returning home for lunch, carrying his hoe. Maria's fresh laundry is hanging on the terrazzo above mine. And me--I am the crazy American artist, running around with my camera, taking photos in the hot sun while every sane Italian is going to rest until the heat subsides."